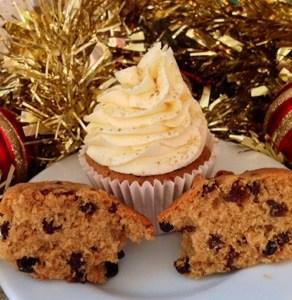 These cupcakes are a great alternative to mince pies – sweet, indulgent and delicious. Perfect for handing around to family and friends over the festive period. After baking numerous Christmas fruit cakes I had some left over fruit that had been soaking in Brandy and I was just waiting for an excuse to use it up. My boyfriend’s Dad paid us a surprise visit at the weekend so I quickly whipped up a batch of these for him to take back home with him. Boozy Brandy cupcakes are actually one of my favourite cupcakes as they are so full of flavour making them super indulgent and special. These cupcakes are incredibly tender and moist, one of the most delicious cupcakes I have made so far; they are so good that a simpler icing could be used with great results – or no icing at all, which is how my little boy likes them. He doesn’t like traditional fruit cake but he did love these, so they are attractive to adults and little ones. 8. Remove from your oven and transfer to a cooling tray. I literally throw all my buttercream ingredients in the mixer bowl and whizz up together until pale and smooth then using a piping bag and nozzle, pipe on your cupcakes. I also sprinkled with a tiny bit of cinnamon and drizzled with golden syrup. They are totally delicious! The orange really compliments the Brandy and the fruit. For an alternative idea you could even add some cranberries or white chocolate to the buttercream.